There are so many different stories and debates about the true origin of the rocking chair. Many credit it to American inventor Benjamin Franklin. However, there are also stories that suggest that the very first rocking chair was created by a German craftsman named Michael Thonet in 1860. He steamed pieces of wood in order to form the chair’s rocker and facilitate that gentle swooping movement. From the 18th century and beyond, rocking chairs have become a staple in homes particularly in the porch, front lawn, and nurseries. Regardless of its origin, it is undeniable that antique rocking chairs offer a nod to the nostalgic days before iPhones and internet came into the picture. It also played a prominent role in history, architecture, and pop culture. It can be said that nearly every home in America had rocking chairs by the porch. It was a place that people went to in order to relax and slow down time. For this reason, the demand for rocking chairs remains consistently high even with the advent of more modern furniture styles. This is also the reason why antique wooden rocking chairs are considered of high value since they are rarely manufactured these days. · Victorian – As the name implies, this type of rocking chair originated from the Victorian era. They are typically made of oak and are very well crafted. Victorian rockers, as they are often called, are manufactured for use in the home and are typically smaller as compared to the other types of rocking chairs. · Grecian – This is one of the most distinctive types of rockers in the market. Instead of wood, it is made with woven rattan. They do look beautiful but do not last as long as the wooden rocking chairs. · Gungstol – This is a more unusual type of rocking chair because it consisted of three legs on each side. Hence, it provides stability such that it won’t topple over even if you rock it vigorously. This type of rocking chair originated in Sweden and is considered as one of the rocking chairs that are hard to find in the market. · Windsor – This type of rocking chair is associated with the country, or for outdoor use. A good example would be the ones used in the front porch. Windsor chairs first became popular in the rural areas of England. They are characterized by the presence of a spindle at the back of the chair and armrest. Over the years, the Windsor rocking chairs made it to the US. This style best represents what most people would picture rocking chairs would be. · Bentwood – This is considered as one of the earliest styles of rocking chairs in the market. 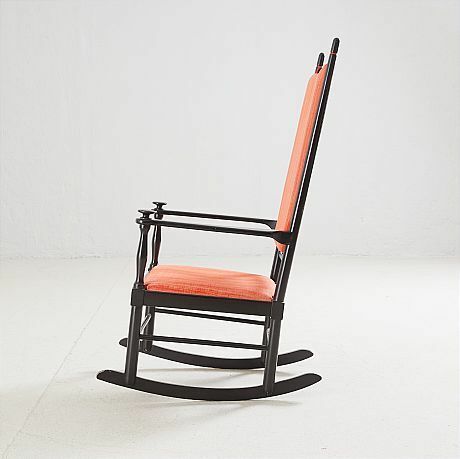 The first of its kind was manufactured by the Thonet brothers, who were attributed to the first rocking chair ever made. They used soft beech wood to form the rocker. Since the first make was released into the market, this particular design was widely copied in various parts of the world. · Sewing – This is another classic style that is mostly seen during the Victorian era. They are particularly small in size and had no (or low) arms. It got its name from its function – they were used by the lady in the house for sewing, crocheting, or nursing babies. Now that you have a basic grasp on antique rocking chairs identification, it is time to move on to the next important question: how much are they worth? 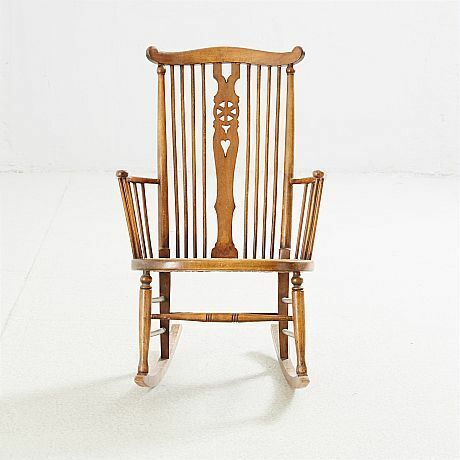 In professional auctions and online appraisal shops, rocking chairs are highly coveted. The average value of antique rocking chairs can be anywhere from $300 to $500. Depending on the provenance and the style of chair, it can even be worth more than that! When you browse websites like eBay, you will find many options that are available in a wide price range. For example, there is a Vintage Antique Oak Rocking Chair priced at US $450. Around the same price range is the Rare Vintage Cornell College University Nichols & Stone Windsor Rocking Chair that is built solid and currently priced at US $499.78 on eBay. The highest value offered on ebay is this Rare Vintage Studio Made Rocking Chair, which is valued at US $700. This one is constructed with carefully crafted bentwood frame and circular rocker that acts as an armrest too. The above guidelines and estimates on antique rocking chair price guide is only an estimation. The expert antique appraisers will use a basic set of parameters to determine how much an antique piece is worth. However, a physical examination of the object is required to determine its actual market value. · Stability (Condition) – During appraisal, the rocking chair will be tested for stability. From the seat to the arms and the rocker, all parts will be examined closely. If the rocking chair is fragile or wobbly, it will be valued considerably less than ones in tip-top condition. · Type of wood – The type of wood (or material) used for constructing the rocking chair can also be a factor. Oak is the most common and preferred material for antique rocking chairs 1900’s (or before) had to offer. Other high-end wooden materials include cedar, birdseye maple, and cherry. · Style – The style of the rocking chair must be considered not just for aesthetic reasons; it can also impact the overall value. The style can be linked to the period of time when it was manufactured. Thus, appraisers take this factor into consideration, especially when there are specific markings or signature. · Provenance – Does your antique rocking chair have an interesting story associated with it? If the provenance of the chair makes it more unique and coveted by avid collectors, then you can also expect the value to increase.